Dubai travel tips: What to do and see in Dubai! Dubai! The city of superlatives has been on our list for a long time now. We’ve heard so many great and just as many negative things about Dubai, so we just had to make up our own minds about the city. And so we decided to stopover in Dubai for two days on our way to Myanmar. In our Dubai travel tips post, we want to show you what sights and highlights await you in Dubai. 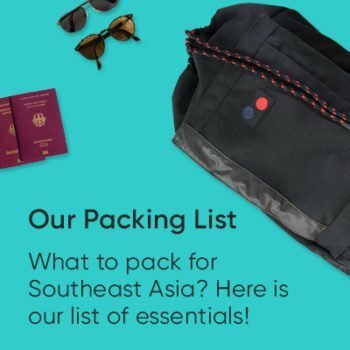 We give you practical tips and of course we also explain how to add a stopover to Dubai on the way to Asia or Australia. In Dubai, everything is bigger, taller and better than anywhere else in the world. This megalomania is on full display in some of the most important sights in Dubai. Of course, the absolute highlight for a Dubai stopover or a longer city trip is the Burj Khalifa. 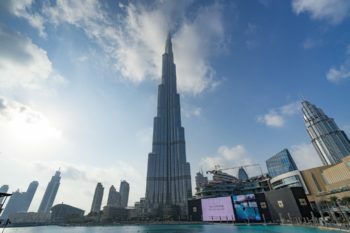 Since everything in Dubai always has to be bigger and better, it’s no wonder that the highest building in the world is located here. The Burj Khalifa stands tall at a proud 828 meters (2,716.5 feet). By comparison: The Berlin TV Tower, the highest building in Germany no less, isn’t even half as tall at 368 meters. You can also spend the night at the Burj Khalifa. The Armani Hotel isn’t exactly a bargain, but then what is in Dubai? 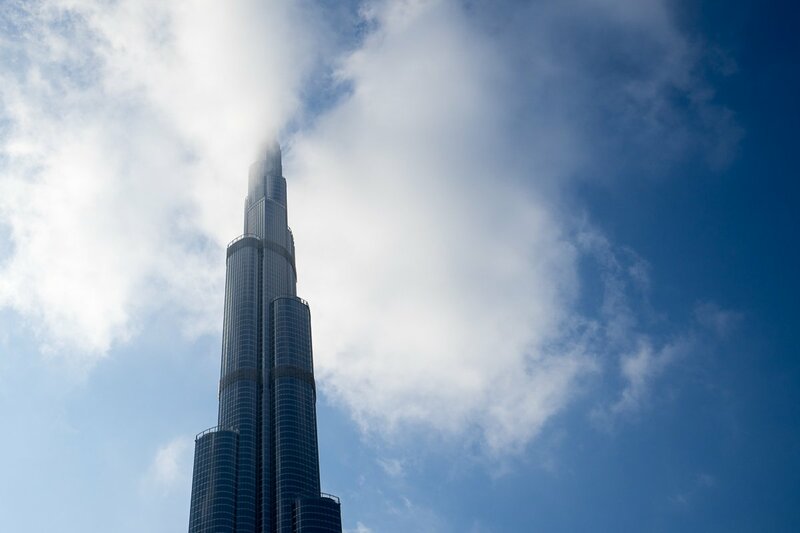 The Burj Khalifa disappears behind the clouds every now and then. No wonder at a height of over 800 meters. View from the Burj Khalifa. Unfortunately, it’s very dusty in the desert. The Dubai Creek is an estuary with a length of 14 kilometers and is a kind of lifeline for the old Dubai. The Creek divides the old city districts of Deira to the east and Bur Dubai to the west. Crossing over from one part of town to the next by water taxi is an absolute must when visiting Dubai. The boats leave when all the seats are filled, which generally doesn’t take very long. The trip only costs 1 dirham, which is equivalent to about 25 cents. There’s a lot to discover along the Dubai Creek. This beautiful dome for example. Deira is the second oldest district in Dubai. It lies to the east of the Creek near the airport. 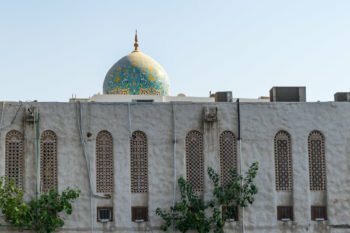 A stopover in Dubai should definitely include a trip to Deira. The markets are definitely the highlights of the district. 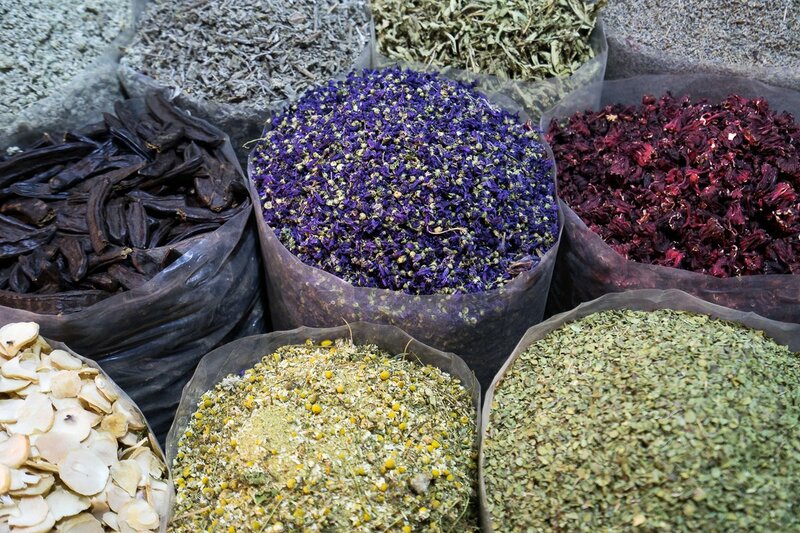 Vast quantities of jewelry are traded in the Gold Souk while the Spice Souk features spices upon spices. The markets really come to life in the evening when it’s not quite as hot out. Taking a stroll through the market can be a little exhausting at times because the merchants aren’t exactly known for holding back. 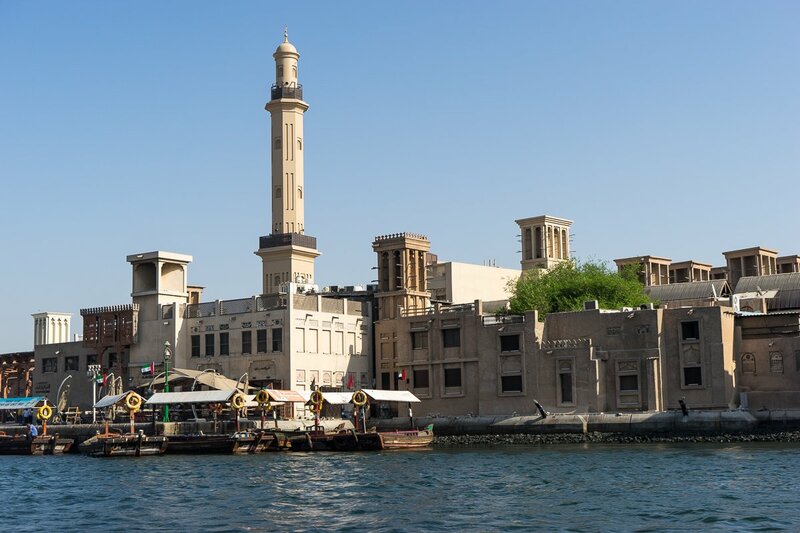 To the west of the Dubai Creek lies the oldest district of the city: Bur Dubai. Here you can marvel at the Emirate’s oldest buildings. In the Bastakiya quarter, the old clay buildings with their characteristic wind towers — a natural air conditioning system — were recently restored and now they tempt visitors to take a pleasant stroll through the old alleyways. Right next door is the 200-year-old fort Al-Fahidi, which is now home to the Dubai Museum. 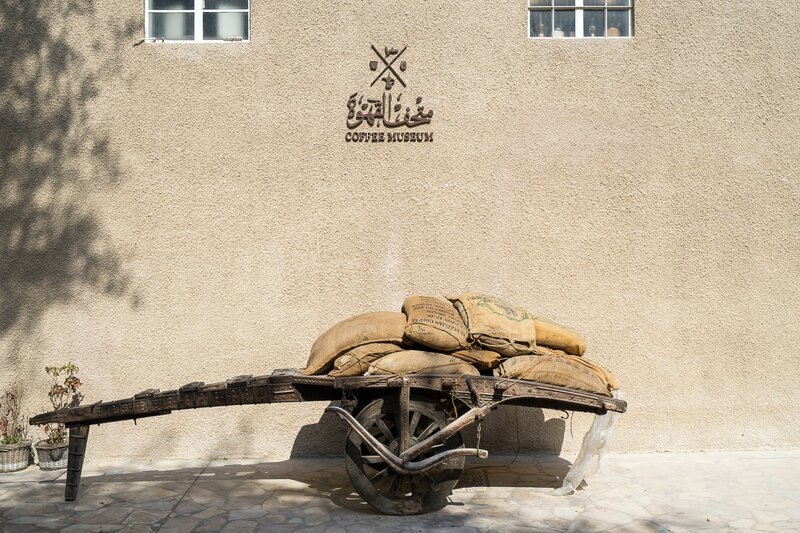 The museum is nicely done and you can learn a lot about the history of Dubai’s rapid development from a Bedouin settlement in the 18th century to the city of superlatives it is today. This picture was taken in the Bastakiya quarter. A mall as a highlight? For real? 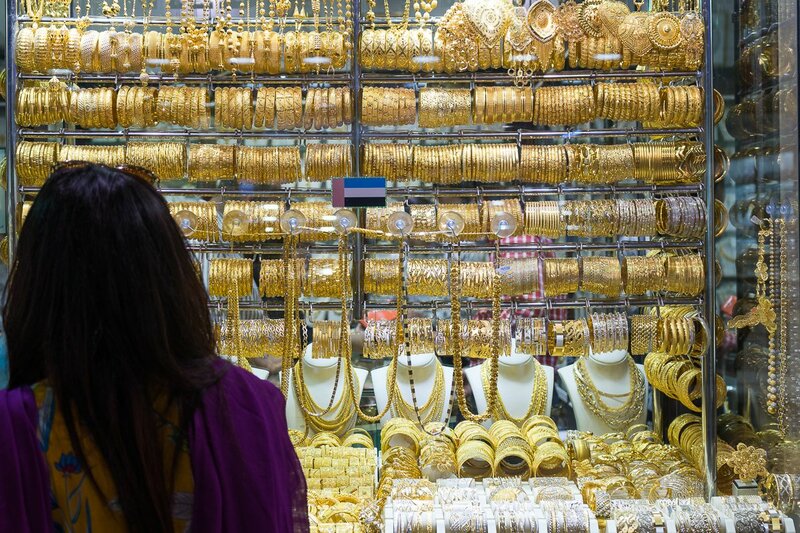 Usually we’d agree, but after all, Dubai is a city of unbridled consumerism. And the Dubai Mall is the best example of this. Sounds ludicrous? It really is! 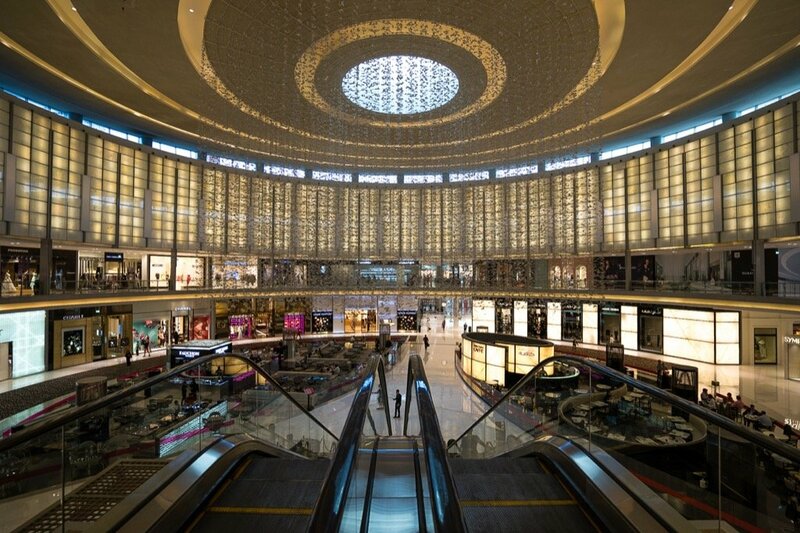 The Dubai Mall is right next to the Burj Khalifa, and the entrance to the observation decks is also located inside the mall. 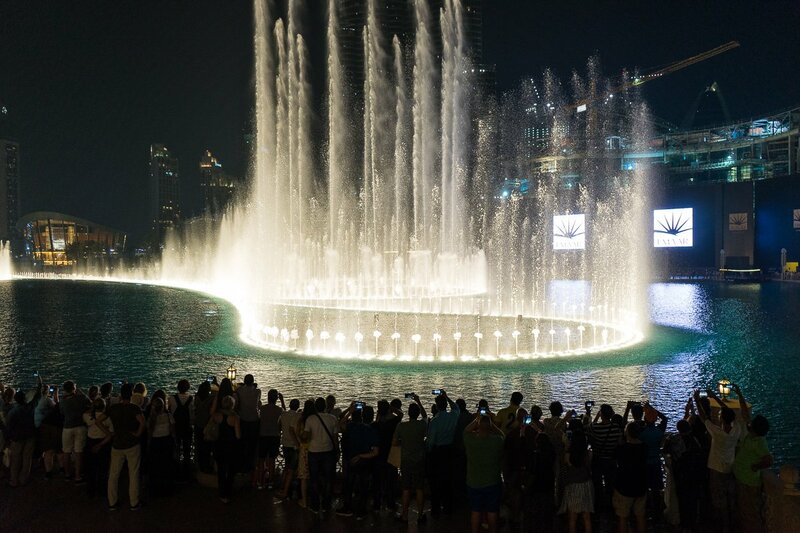 Every evening, there’s a choreographed fountain show with musical accompaniment in front of the mall. But honestly, it was a bit underwhelming. The area around the mall and the Burj Khalifa is one huge construction site. New high-rises are popping up all over the place. Insanity! 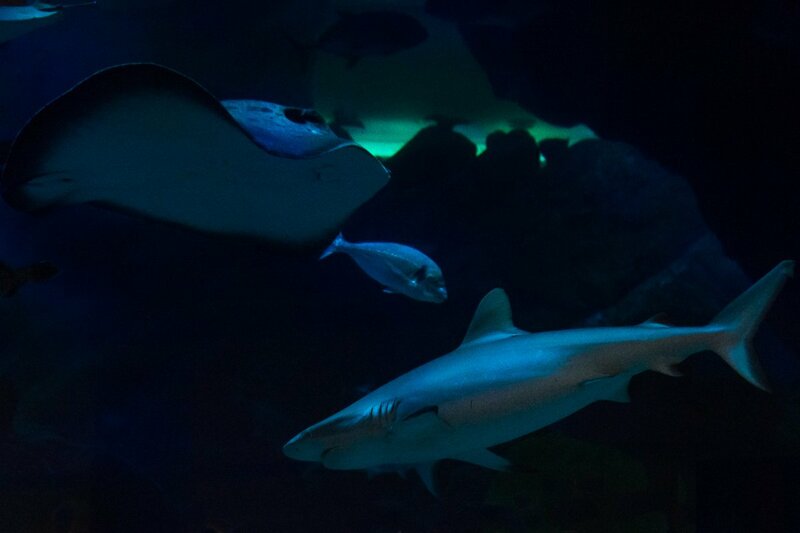 We had two full days in Dubai and only had time to visit the first five highlights in this post. Of course there’s still a lot more to discover, but we didn’t get around to it ourselves. Nevertheless, we don’t want to keep it from you. The Burj Al Arab, one of the most luxurious hotels in the world, is one of them. We simply didn’t have the time. But you can’t just stroll into the hotel anyway. Fortunately, there are several options available to see it from the inside. Unfortunately however, none of them are particularly cheap. We’d be jumping for joy at the huge commission we’d be getting. After all, even the smallest rooms start at about 1,700 euros per night. But since 170 square meters can get a bit cramped sometimes, we’d definitely recommend one of the larger suites. Getting into the building isn’t all that easy if you aren’t a guest. Just moseying into the lobby, taking a few pictures, and leaving again isn’t an option. So if you don’t happen to have a spare 2,000 euros for a one-night stay, which we can totally understand, you can still grab a bite to eat or drink at the Burj al Arab. The prices are outrageous, but unfortunately there’s no other way. This offer includes a hotel pickup and up to 90 euros’ worth of drinks. But while that might sound like enough for an all-night bender, it’ll only just about buy you two cocktails. If you’re lucky. If you’d prefer something a bit classier, then this might be your cup of tea. But tea isn’t the only thing on the menu — you can also indulge in champagne, fine pastries, sandwiches and canapés. And tea. Obviously. Of course you can also have a meal in the Burj al Arab. The dinner buffet provides a veritable cornucopia of culinary delights. The best way to see the Palm Islands is from above because that way you can truly appreciate the pure insanity of it all. There are a total of three palm-shaped, artificial island groups off the coast of Dubai. With a bit of luck, you can see the islands from one of your plane windows upon arrival. There’s not much to see or do once you’re actually on one of the islands though. Just one luxury building next to the other, and lots of hotels of course. 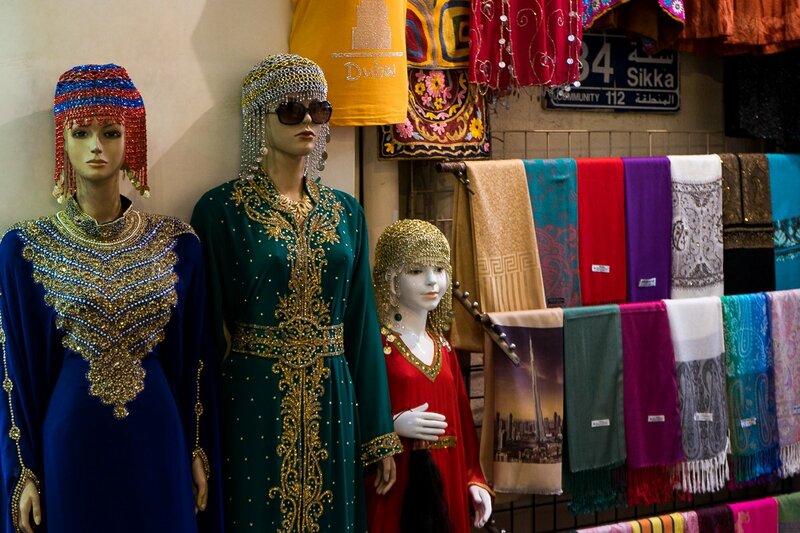 We visited Dubai as a stopover on our way to Myanmar and we’d recommend that you do the same. If we’re being honest, two days in Dubai was more than enough. It’s something you should at least see once if you have the opportunity, but we couldn’t imagine staying there for longer than two days The city certainly has a few sights to offer, but it’s completely lacking in flair and charm. Taking a stopover in Dubai is really easy when you’re flying to another destination with Emirates. If you have to change planes in Dubai anyway, why not stay for a day or two? Conveniently enough, Emirates doesn’t charge any extra for a longer stopover. If you’re flying with Qatar Airways, for example, a longer stopover in Doha would cost you an extra 100 euros. And there’s another thing that comes in handy; Emirates flights are always cheapest when you book them through the Emirates website. There are no third-party sites that offer Emirates flights at a cheaper price. 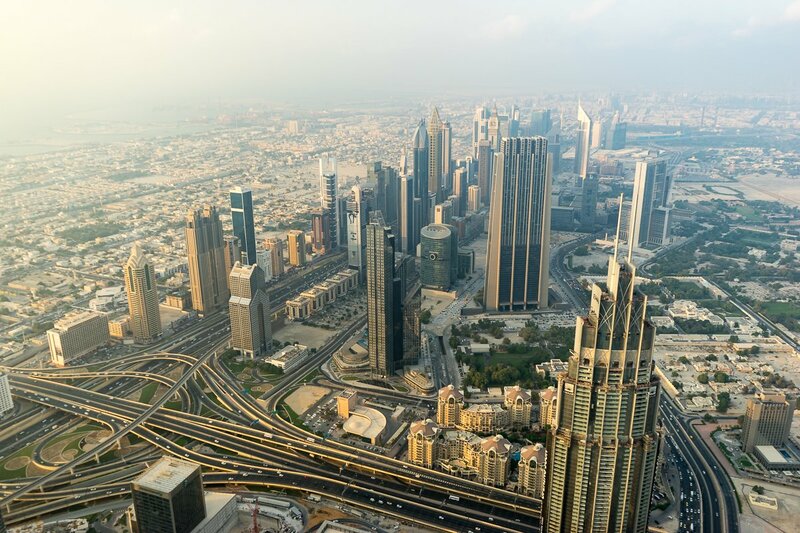 To book a stopover in Dubai, select the ‘advanced search’ tab and enter the flights individually, e.g Frankfurt-Dubai, Dubai-Bangkok, Bangkok-Frankfurt. It’s up to you if you want to stopover on your outward leg or when you return — or both. It makes a lot of sense to do it on your way there because stopping over in Dubai mellows the jet lag so you’ll get more out of your vacation. It doesn’t really make that great a difference which part of Dubai you stay in. Strolling through the streets of Dubai in the evening isn’t much fun, so you’ll be taking the metro or a cab from one place to the next anyway. We stayed at the Somewhere Hotel Apartment in the Deira quarter. The hotel is perfectly located for a stopover in Dubai: right by the metro station. You can get to the airport in 10 minutes by metro, and it’s also only a short journey to all the sights. The rooms are very large, well-furnished, and not all too expensive by Dubai’s standards. We’ll definitely stay there again if we ever stopover in Dubai again. If you’ve made up your mind to stopover in Dubai, here are a few more practical Dubai travel tips for your stay. Dubai is no place for pedestrians. That’s just the way it is and you’ll understand why once the unbearable heat hits you. The time from November to April is the most pleasant — or at least the most bearable. The easiest way is to take the metro. The red line runs frequently every day between 6 am and midnight, passing through Deira and Bur Dubai to Burj Khalifa and even further. The journey is fast, comfortable and only costs a couple of euros depending on the distance. A taxi is a good alternative if you arrive after midnight. There’s a taxi stand in front of the airport and it isn’t even that expensive. We paid 8 euros for the trip to our hotel, but then it wasn’t very far from the airport. The metro is a great way to explore Dubai. But some things are different than in the rest of the world. For example, there’s a first class, always located in the rear carriage, and there’s a compartment just for women, in between the 1st and 2nd classes. Singles cost between 1 and 3 euros, depending on the distance. A day pass costs 22 Dh (≈5.50 euros), which is a pretty good deal. You have to hold the tickets up to the ticket reader when you enter or leave the station. 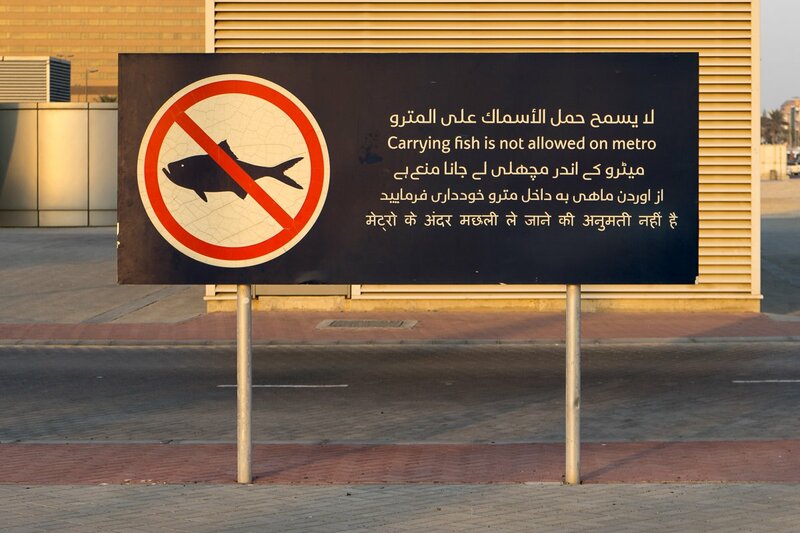 Sadly, you can’t bring your fish on the metro. Sorry! Taxis in Dubai are cheap and reliable. Drivers always turn on the meter and a fare rarely comes to more than 10-15 euros. Hop-on/hop-off buses aren’t really our style, but in Dubai they’re actually very convenient. Metro stations are often a fair distance from the actual sights. Burj Khalifa station, for instance, is about a kilometer from the skyscraper itself. The Hop-on/Hop-off buses will take you right up to the major sights, which is much more accommodating. If you don’t have much time in town, a guided city tour of Dubai is probably worth considering. That way, you can see all the sights in a single day and don’t have to spend a second day in Dubai. The official currency in Dubai is the Emirati dirham (AED). The euro conversion rate is about 1:4, that means you get 4 around dirhams for 1 euro. There are ATMs everywhere so withdrawing money is no problem. Overall, Dubai isn’t a cheap place to visit, but if you can make do with a simple hotel and local food (very delicious! ), then you won’t have to spend heaps of cash. If you really want to live the high life, then Dubai offers ample opportunity to go wild, and you can easily drop a small fortune there in no time. 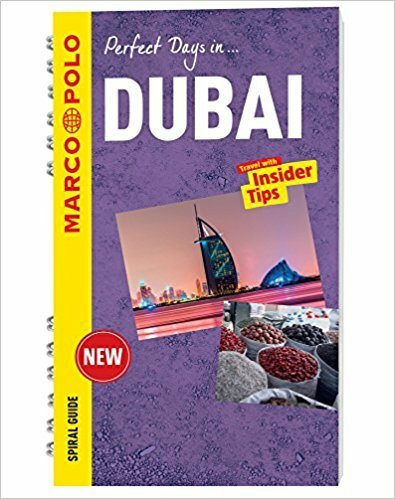 We bought a Marco Polo travel guide for Dubai at the airport before leaving for Dubai. It’s small, compact and more than enough for a stopover in Dubai. 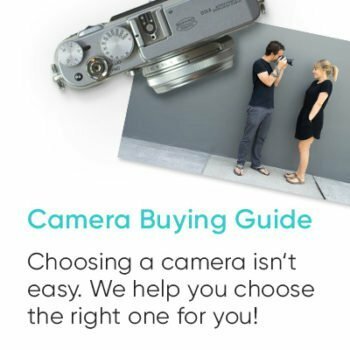 It’s a bit annoying that the travel guide keeps throwing around the term “insider tip” like there’s no tomorrow but then lacks essential features such as a metro map. And the so-called insider tips listed on almost every page are actually pretty run-of-the-mill tourist tips, but it’s still a decent enough travel guide for a short stay. We already hinted as much above: Dubai didn’t exactly blow us away. We just don’t have much use for shopping malls or gratuitous displays of wealth maintained by inequality and exploitation. Nevertheless, we still recommend taking a quick stopover in the city. It’s worth visiting for a day or two, but that’s about it. Have you ever been to Dubai? What did you think of it? Do you have a great must-see tip? Or perhaps you can convince us to return and give it a second chance? We’re looking forward to your comment! 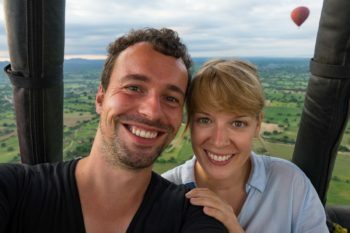 Such nice article and some wonderful tips for budget travel. This destination is in our travel plans for upcoming years. I am glad to read about this wonderful post. I love traveling or tourism and also like to read about travel info.